Colcannon is so much more than mere cabbage and potatoes. Still not convinced? Taste this version with kale and bacon and beer and get back to us. 1. Fill a large bowl halfway with ice water and put it next to the stove. 2. Bring 4 cups water to a boil in a large saucepan. Add the kale and return to a boil. Reduce the heat to a simmer and cook for 3 minutes. Drain the kale and add it the ice water to stop the cooking. Drain the kale again and transfer it to paper towels to dry. 3. Melt 1 tablespoon butter in a large Dutch oven over medium heat. Add the cabbage, onion, garlic, bay leaf, mace, white pepper, mustard, cayenne, and 1/2 teaspoon salt. Cook, stirring often, until the onions are soft, about 8 minutes. 4. Add the beer and cook, stirring almost constantly, until the liquid has evaporated, about 2 minutes. Add the chicken broth, reduce the heat to medium-low, and cook until the liquid is reduced by about half, 5 to 8 minutes. Remove the bay leaf. 5. Stir in the blanched and drained kale and remove the pot from the heat. Add salt and white pepper to taste. Cover and keep warm while preparing the potatoes. 6. Cover the quartered potatoes with cold water in a large pot. Place over high heat and bring to a boil. Salt the water generously, and then turn the heat down to a simmer and cook until the potatoes are tender, 15 to 20 minutes. Drain the potatoes, setting the empty pot aside, and mash them in a large, sturdy bowl until they begin to have a creamy consistency. 7. Pour the cream into the empty potato pot, add 1/2 cup butter and a few pinches of salt, and warm over medium-low heat until melted. Combine the butter mixture with the potatoes and continue to mash until smooth. 8. 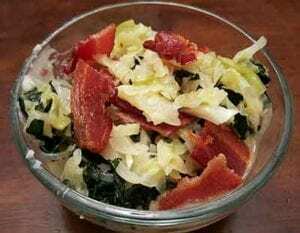 To serve, divide the potatoes among bowls, top with the cabbage mixture, and garnish with crumbled bacon. Colcannon. What a warm, comforting, filling dish, perfect for fall or winter. I've had colcannon served many ways over the years, but the versions I've tried have always been comprised of the veggies mashed into the potatoes. I rather like this version and my family enjoyed the flavors as well. This was my first time cooking with mace and I loved the warmth and the flavor it lends to cabbage and kale. I cooked my bacon in the oven on a sheet pan lined with parchment which made for easy clean-up. My family suggested serving this dish with sausage, such as bratwurst, instead of bacon, which I thought was a great idea. I would definitely make this again and next time I might even lighten up the mashed potatoes with half the butter and milk in place of half the cream. I'm thinking this would make an easy weeknight dinner, especially if there are leftover mashed potatoes on hand. All you would have to do is cook up the cabbage, kale and onions, add a protein, and you're done. I used a Decheutes Pale Ale. The one thing I really wanted to change in this recipe was to saute the kale instead of blanch it. I lost a lot of the green and nutrients in the boiling liquid. When making this on my own I would skip the blanching step and just saute the kale with the cabbage and onion mixture. I don't usually use kale when I make colcannon but I liked this recipe with it. It was delicious. I used a Shipyard Lager. 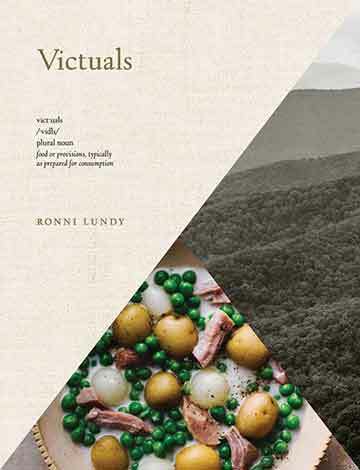 Colcannon Recipe © 2016 Ronni Lundy. Photo © 2016 Johnny Autry. All rights reserved. All recipes and photos used with permission of the publisher. Thank you, that was delicious! Being a conserver of pots and time I opted to cook the kale in the potato water as it was boiling, and simultaneously cooked bacon in dutch oven, then used resulting grease and butter to start off the cabbage and onions. Lovely and comforting. Magnificent, Junie! Love your tweaks to the recipe. Thanks so much for taking the time to share them with us!